DirtWorks is the permanent showroom of Seagrove, North Carolina potter, Dan Triece. His award winning handcrafted works have been shown in fine art and master craft shows in the eastern US from Florida to Maryland and have been featured in several solo and group gallery exhibits. Fine examples of his work are currently included in many private collections in this country and throughout Europe. Dan’s works cover a broad range. 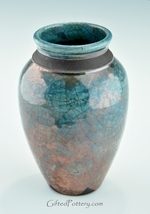 He’s particularly well known for his ornate, copper luster Raku ceramic vessels. His work also features a complete line of functional stoneware, salt glazed pieces and earthenware pottery. Each pot at DirtWorks is made by hand, either wheel thrown or slab built, decorated by hand and fired in the traditional manner. All stoneware pieces are safe for the oven, microwave and dishwasher. Raku items are to be used for decorative purposes only. Ben Vanpelt grew up in Kannapolis, North Carolina before pursuing a bachelor/s degree from Appalachian State University. Ben’s passion for the arts ultimately led him to seek a life in clay, following in the footsteps of his uncle and mentor, Dan Triece. Ben is exploring a myriad of styles, including horsehair and pit firing ceramic pots. He is looking forward to working alongside his uncle at Dirtworks Pottery. Baking/Serving Dish in Southwest Glaze 7.5 in.